Continuing with the Nice Stems! collection is Come to Poppy, a coral-pink with a very slight red shimmer to it. 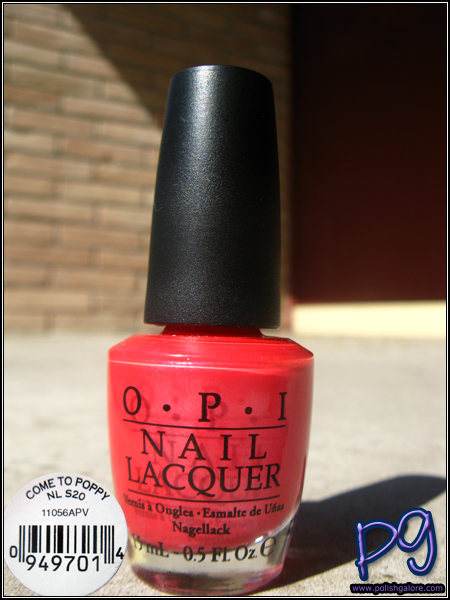 My son calls my dad "Poppy", so this color's name is pretty funny to me. The formula was super nice on this polish. I used a base coat of OPI Natural Nail, 2 coats of polish and a top coat of OPI Top Coat. Look at how shiny this color looks! In the sun you can really see the red shimmer shining through. The bottle looks like a creme but on the nail - nope... it's a shimmer! 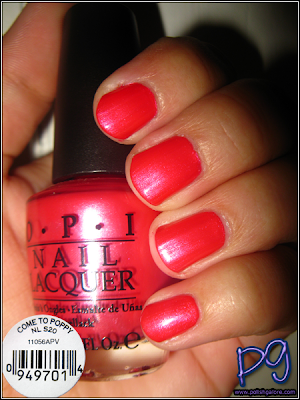 In the shade, the shimmer is hidden and this color is fighting between pink and coral. Very pretty! Indoors with the flash and you can see that the shimmer ALMOST looks like a light lavender or purple but it's not. It's still very beautiful. This shade is still just red enough that I can wear it. Any more orange and it would make my skin look sallowy.